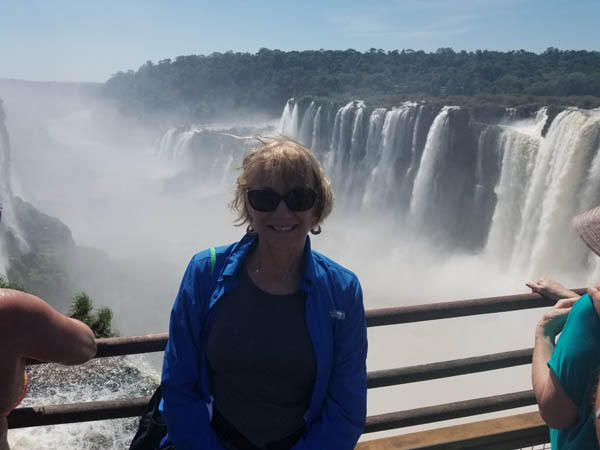 Most of what we saw and did in Patagonia was in the southern half of Argentina. 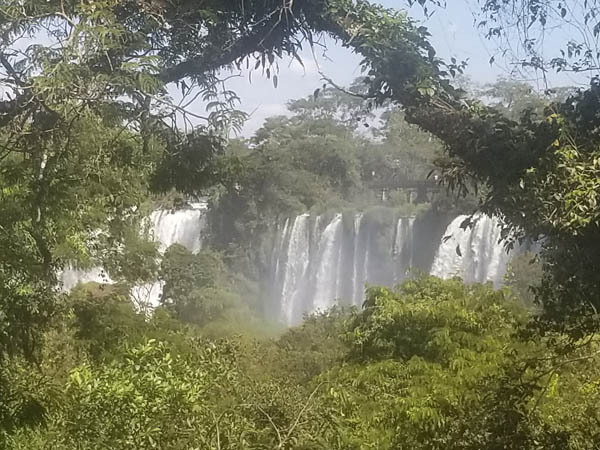 This webpage is dedicated to the northern half, particularly on Iguazu Falls (one of the largest in the world) and Buenos Aires, the second largest city in South America. 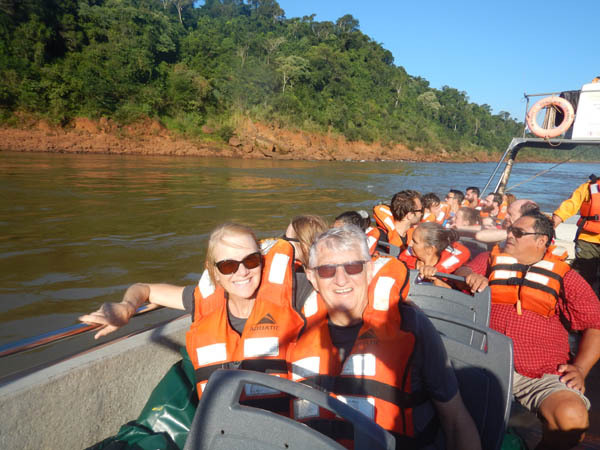 We arrived at our hotel in Puerto Iquazu and was shocked with what we had in store. 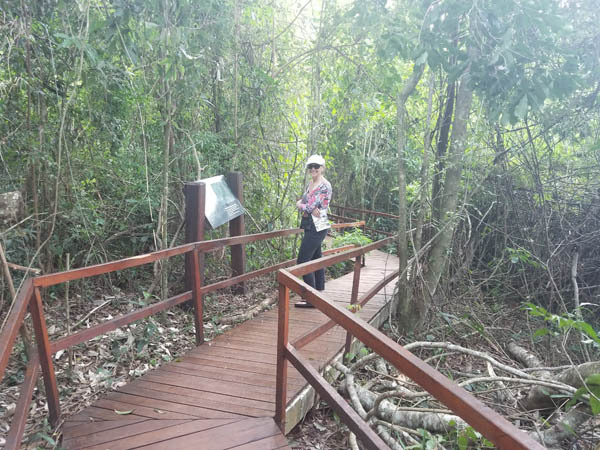 The hotel was in the middle of a jungle. 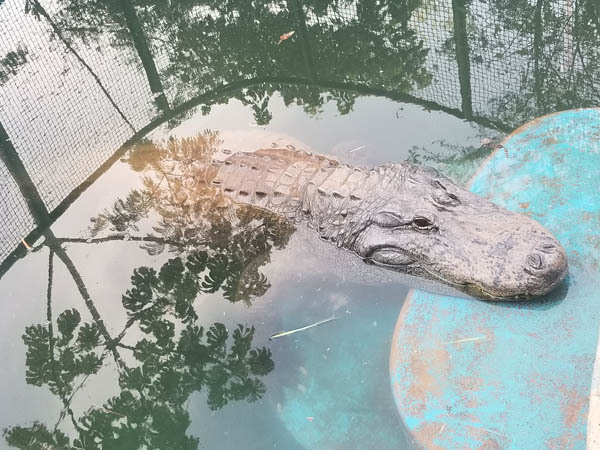 They had their own live crocodiles in separate outdoor cages and lizards, snakes and tarantulas behind glass cages. 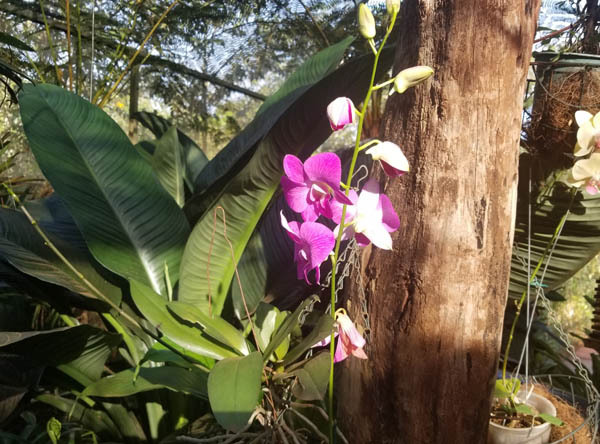 And a greenhouse filled with wild orchids and other plants that are part of the subtropical jungle. 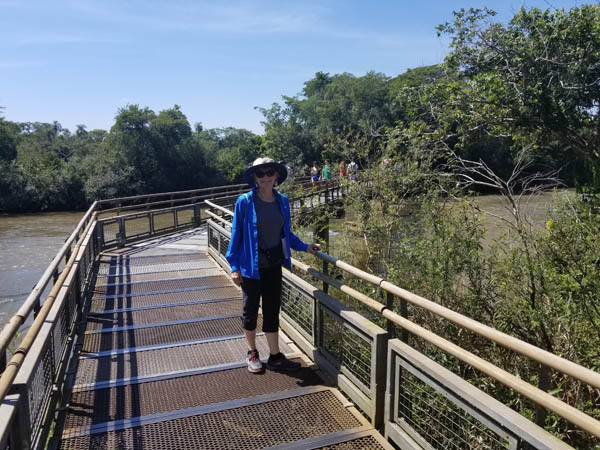 After a cab ride to the National Park and a train ride to the waterfalls, we found miles of walkways and balconies to see everything up close and personal. What started out as still waters soon changed. We were in for a shock as we saw them tumble 280 feet down Devil's Throat. Devil's Throat is where water is falling into the beginning of a canyon on three sides. This walkway puts us on top of Devil's Throat. The views were nearly indescribable! And we couldn't help but get a little soaked as we stood in the mist of the falls. 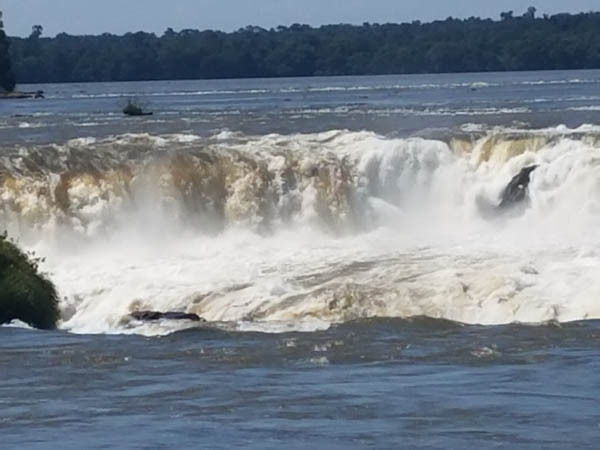 Click to view the falls. 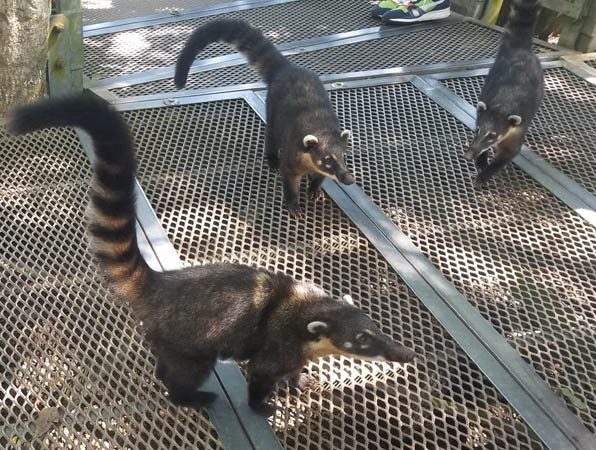 As we trekked along the long walkway, we were greeted by a group of Coatis. They weren't too happy when we left without feeding them. There are over 270 individual falls that plunge into this deep ravine that stretch out over a mile and a half. Everything was lush. 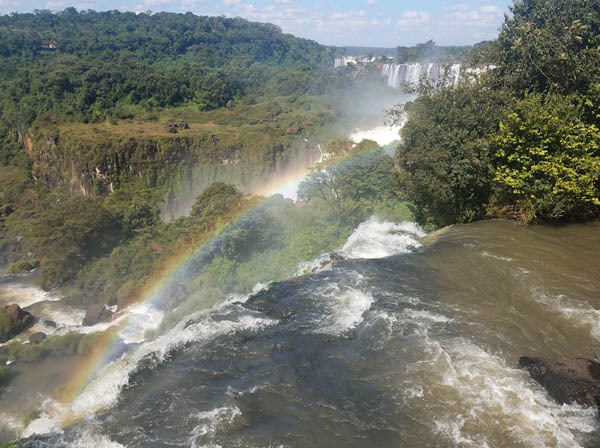 In comparison to Niagara Falls (another beautiful water falls), Iguazu's largest fall is 90 feet taller. 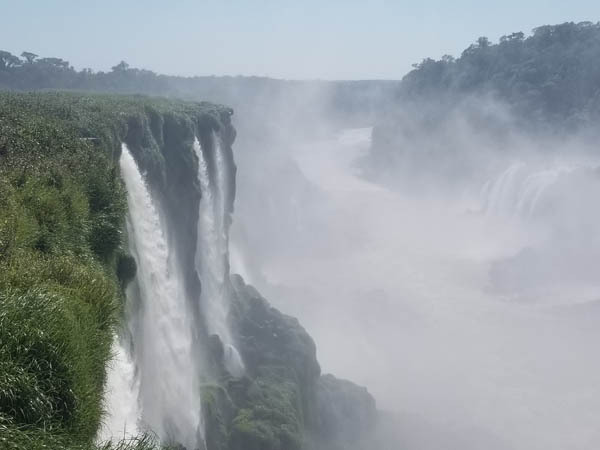 It is twice as wide and has 275 falls as compared to three at Niagara. 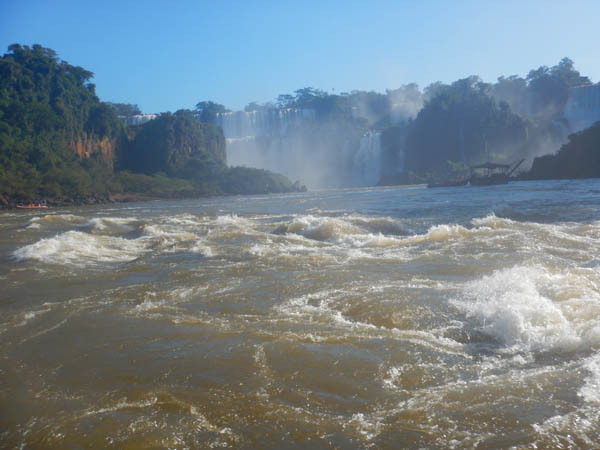 It is estimated that Iguazu is 200,000 years old, while Niagara is 12,000. 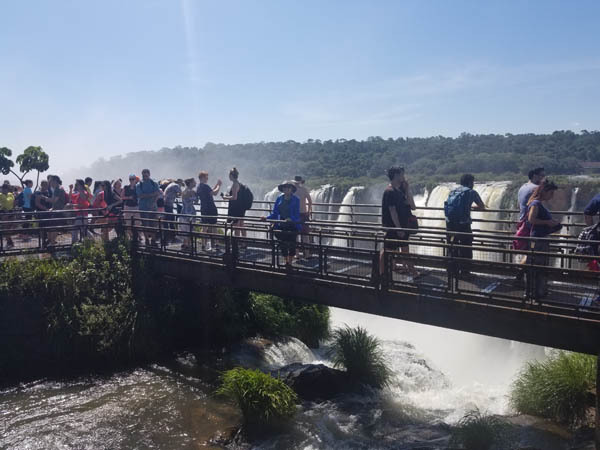 Iguazu is also listed as an UNESCO World Heritage Site and sits in the middle of a national park on the border of Brazil and Argentina, while Niagara sits in a commercialized border between Canada and the USA. Yes, we are on the lower side of the falls. Click to view what happens to us next. We were soaked through and through, but the experience was well worth it. 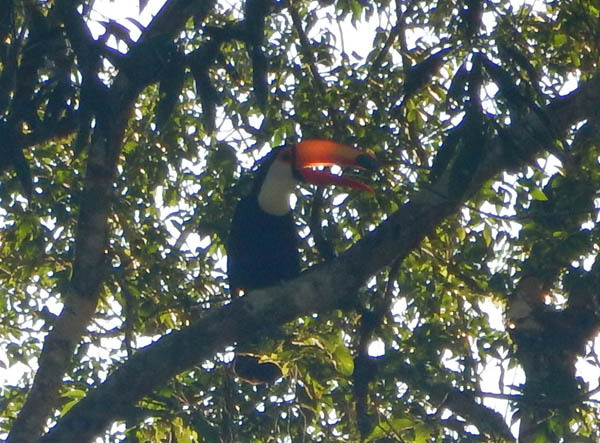 As we drove through the jungle from the river back to the parking lot, we were lucky and got a picture of this Toco Toucan, the largest toucan in the world. 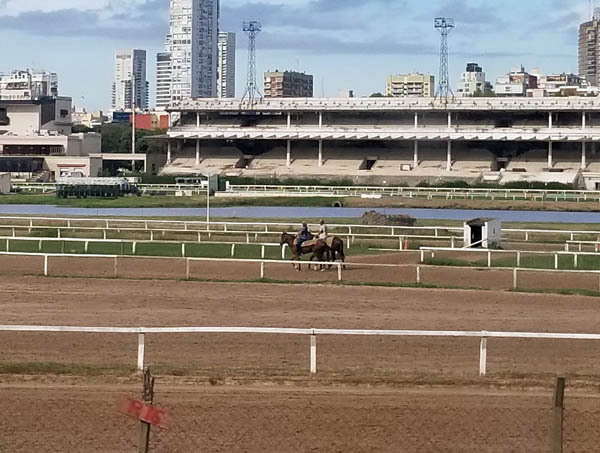 From the deep dark jungle to the bright city lights of Buenos Aires. 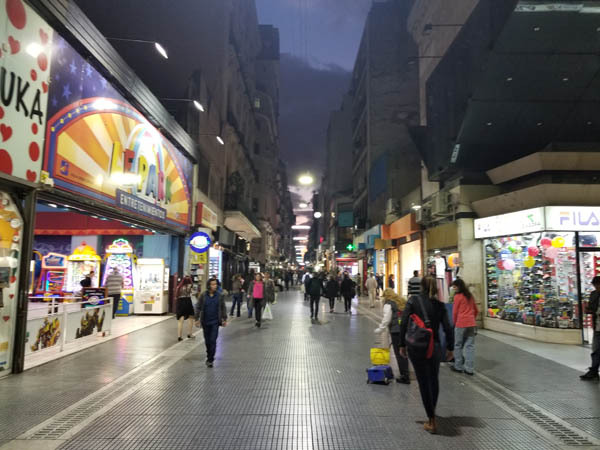 This pedestrian street runs along our hotel and is one of many such streets. The architecture throughout the city center was stunning. Most were built at the turn of the century and well maintained. 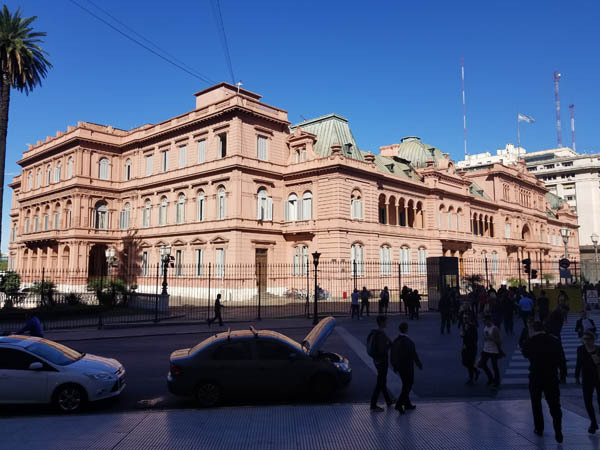 The presidential palace is called the Pink House. 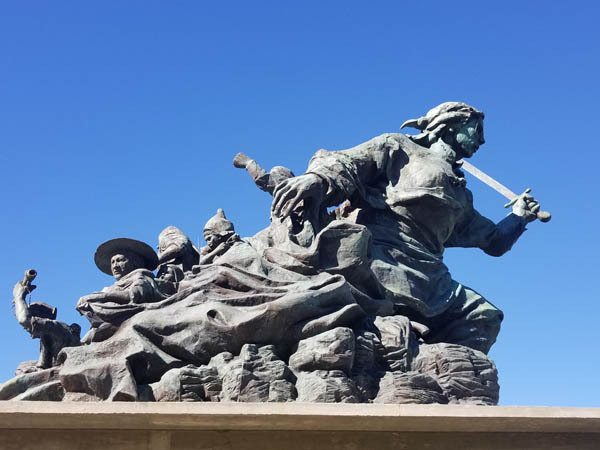 This is a statue of San Martin, one of a handful of heroes that freed most of the South American countries from direct rule of Spain. 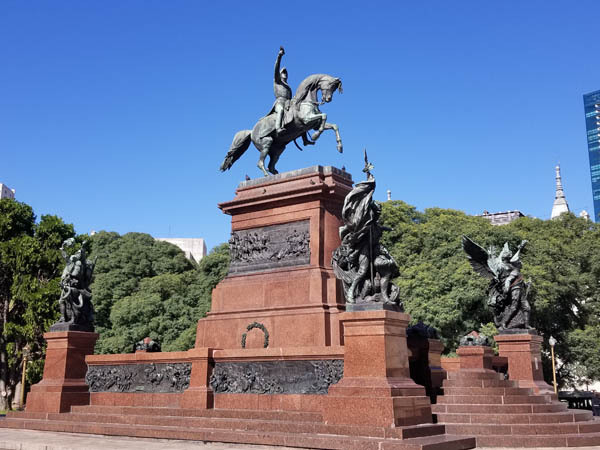 Buenos Aires is lined with memorials to its past, including Juana Azurduy, a Bolivian guerrilla military leader who fought alongside of San Martin to gain independence from the Spanish Empire. 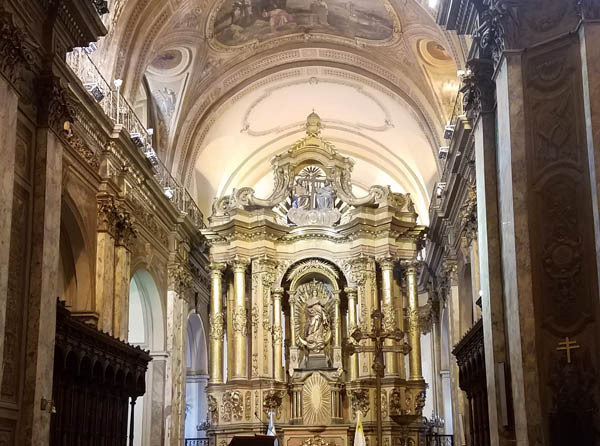 With the Spanish conquest came Catholicism, with all its grandeur. It's truly hard to comprehend the detail that went into every square inch of this Cathedral. 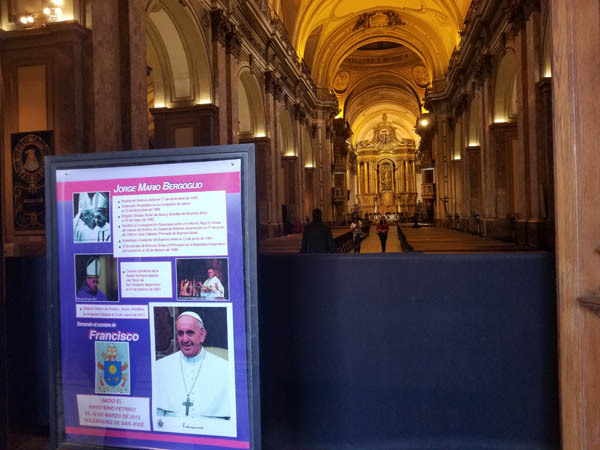 It is the home of Pope Francis, who was ordained here in Buenos Aires in 1969. He is the first Jesuit pope, first from the Americas and the first from the southern hemisphere. 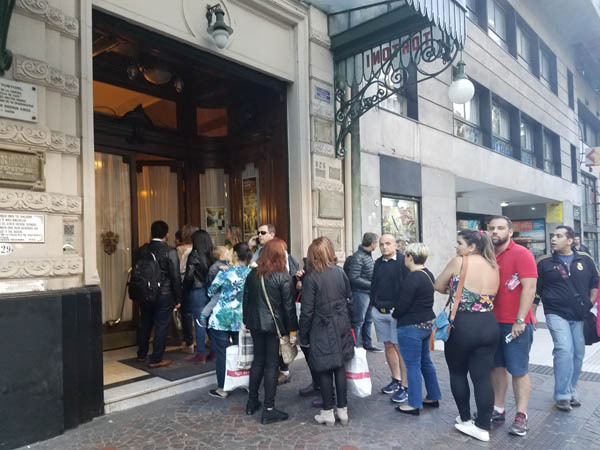 Cafe Tortoni is the oldest coffeehouse in Buenos Aires, established in 1858 and listed as one of the "must see" places to visit. It appears to be on lots of other peoples' list also. 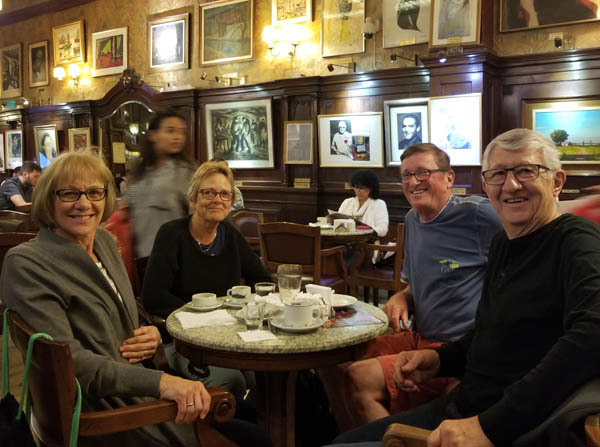 As we stood in line, we met this nice couple from Germany, who joined us for coffee. 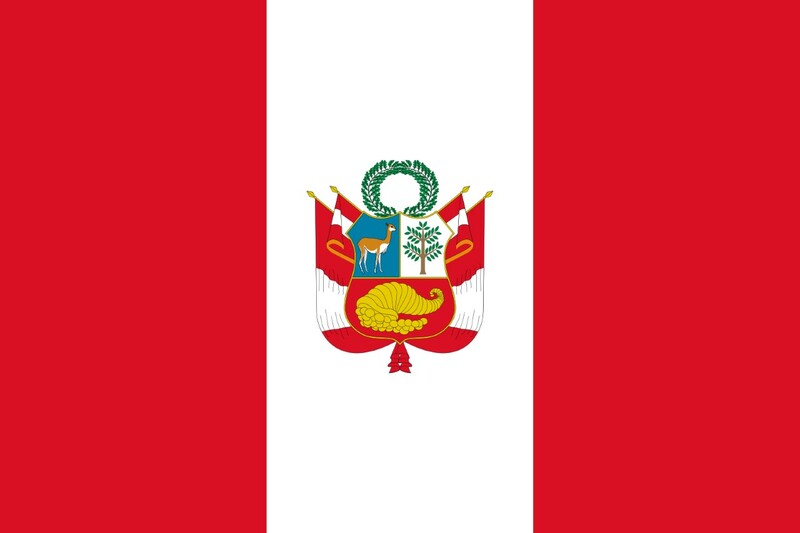 They were spending an extended time in South America, also. But unlike us, this was their third trip to this continent. 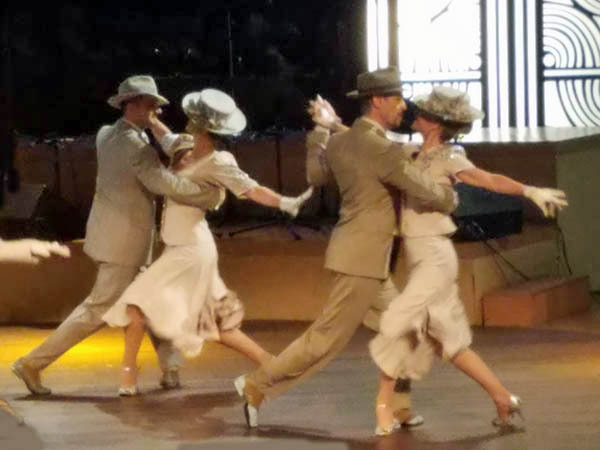 An "Hour of Tango", is a weekly TV show that is performed live each week. Just like the David Letterman show, we got free tickets and told when to applause. It was an awesome performance. We saw a cemetery similar to this one in Ushuaia, but about 1/8 this size. 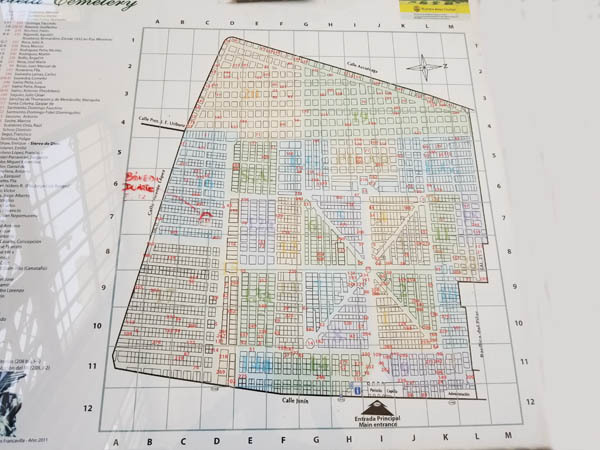 This one is so huge that they have a map with a directory of all the occupants. This is truly a place for the rich and famous. 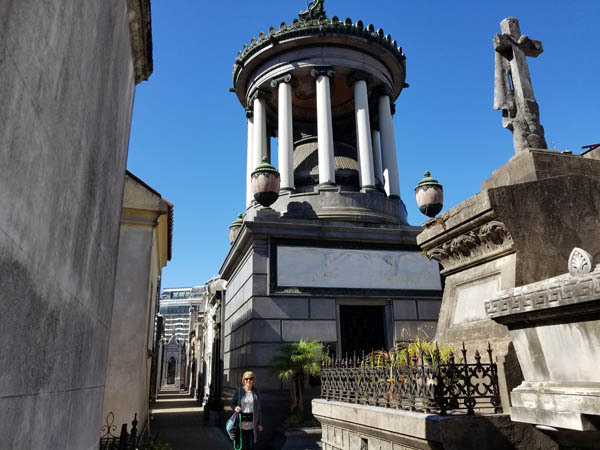 It includes the most affluent and most influential people of Buenos Aires, including Evita Peron, the popular First Lady in the mid-1940s. While everyone was unique in the design and architecture, this one was cool. 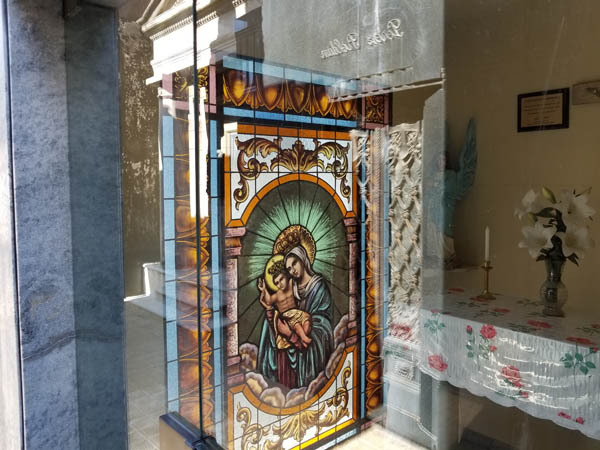 It had a glass door, through which we could see an alter and the stain glass. 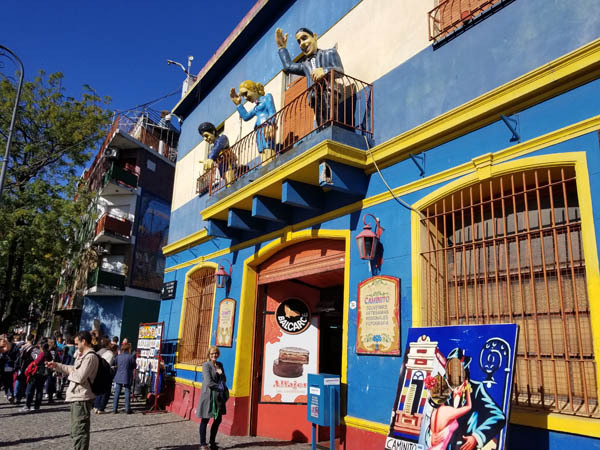 We spent a day walking through La Boca, one of the many notable neighborhoods of Buenos Aires. 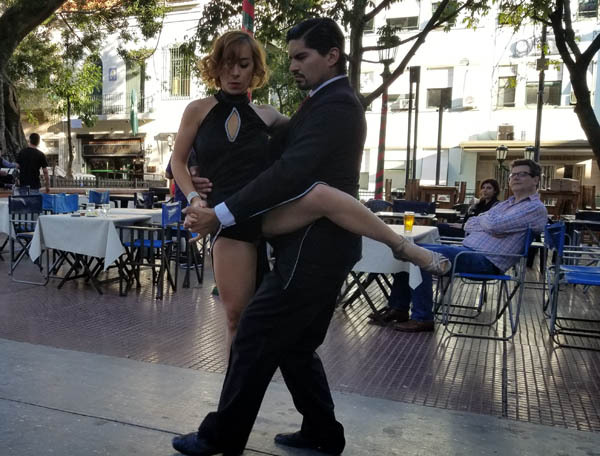 We found this pub where this couple performed the Tango for tips. La Boca started out as an Italian blue-collar area made up of dock workers. 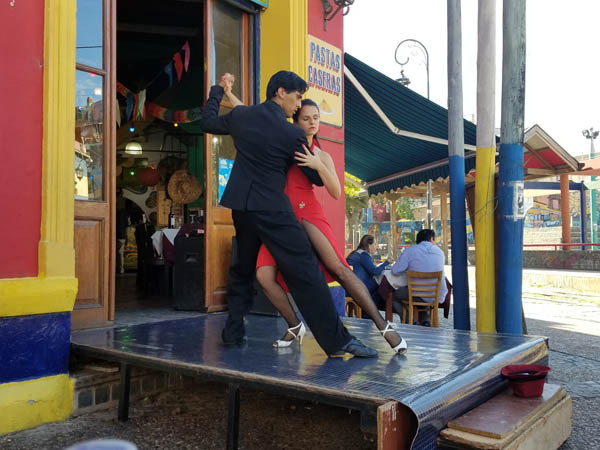 It now attracts international visitors to take in the colorful houses and little walkways that sell Tango related memorabilia. 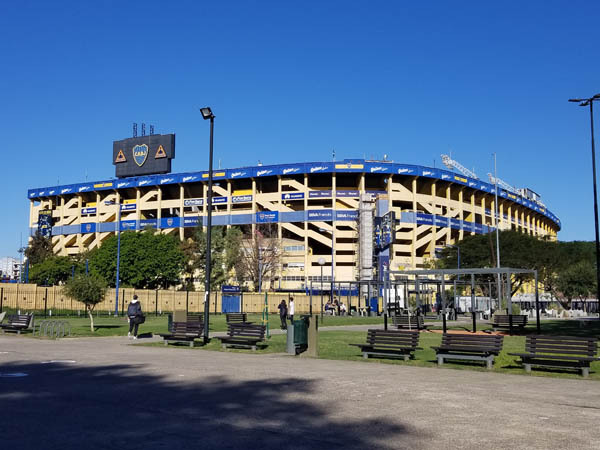 La Barca is also home to the Boca Juniors Soccer (football) team. When we took this picture, they were ranked number one among South American teams. Street performers took up most corners of Florida Avenue. 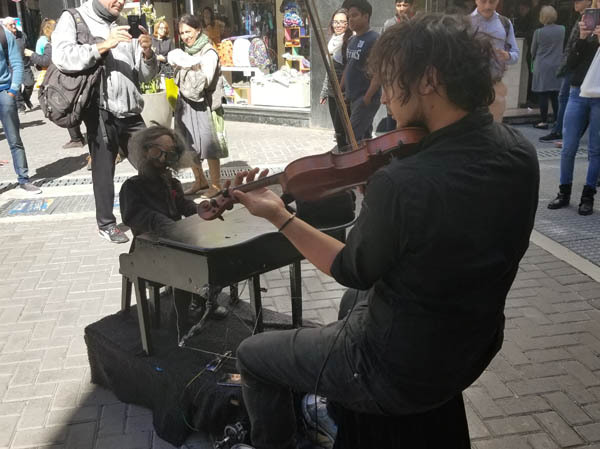 This kid is playing the violin, while his puppet is playing the piano. This couple was performing at another local pub and were awesome. Click to view some tango moves you wish you could do. 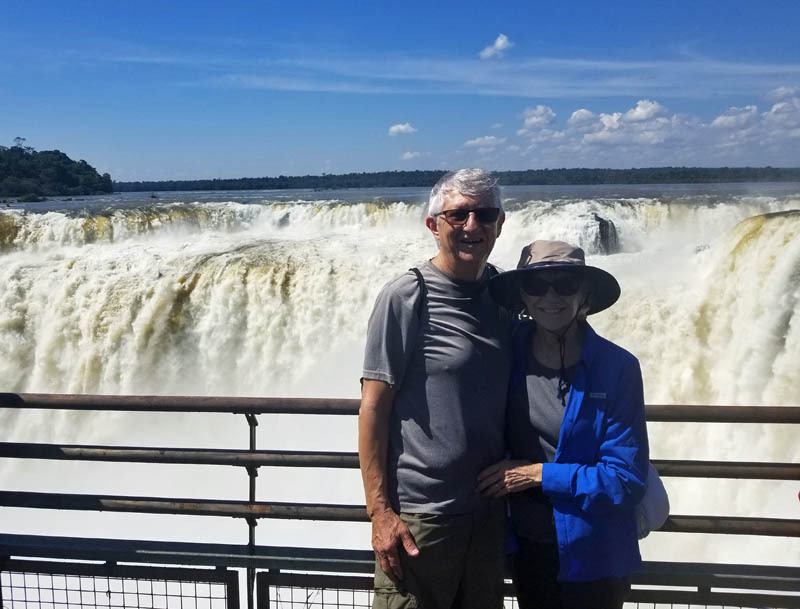 Our last day was spent on the outskirts of Buenos Aires, called Tigre, home of the Parana Delta, South America's second largest water system. We took a train to get there and saw some pretty awesome sites along the way. 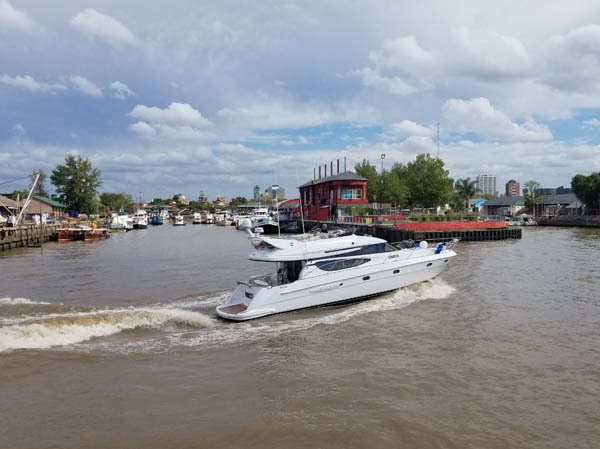 Tigre is a subtropical region, only 15 miles west of Buenos Aires and home to the Buenos Aires Rowing Club. 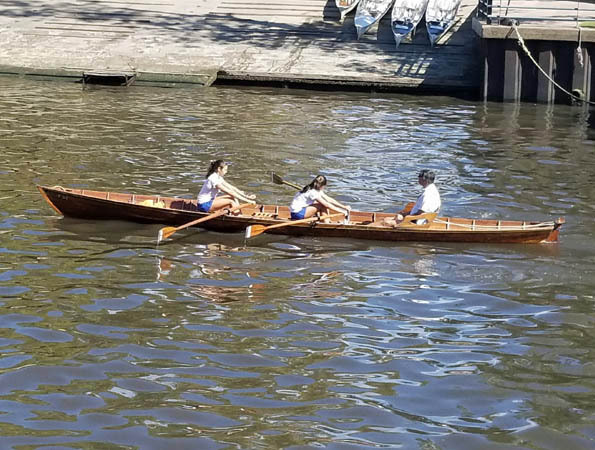 Here is one of several rowing boats we watched as we toured the city. 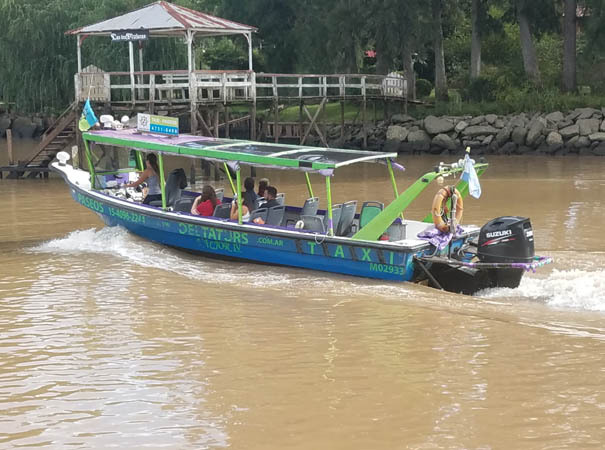 We took this tour boat to get out into the delta to see what makes this town so popular. 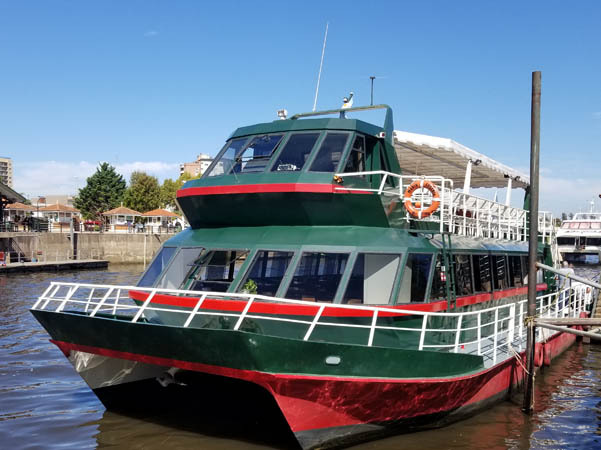 Cruising is one thing that brings those that have this kind of money to explore miles and miles of waterways. 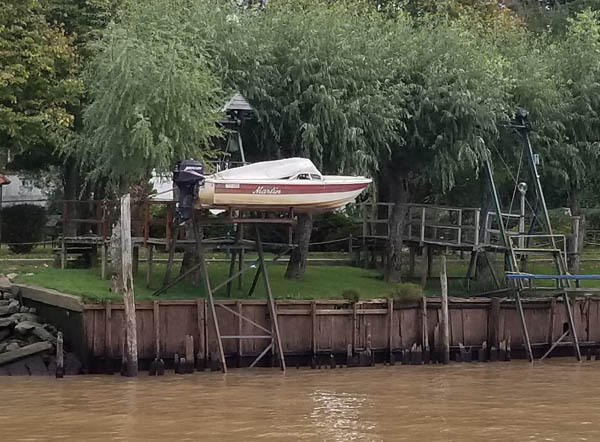 This particular waterway had its own sea wall. 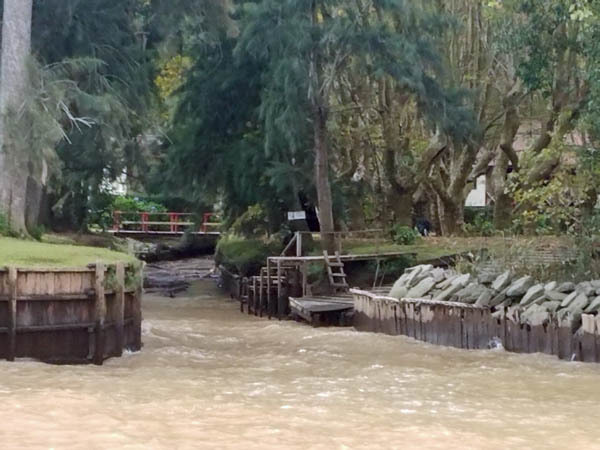 In the background, is a bridge over another waterway. This was a typical lift that kept boats close by, but out of the swift current of the river. Water taxis were running up and down the river past our tour boat. A handy way to pick up groceries. 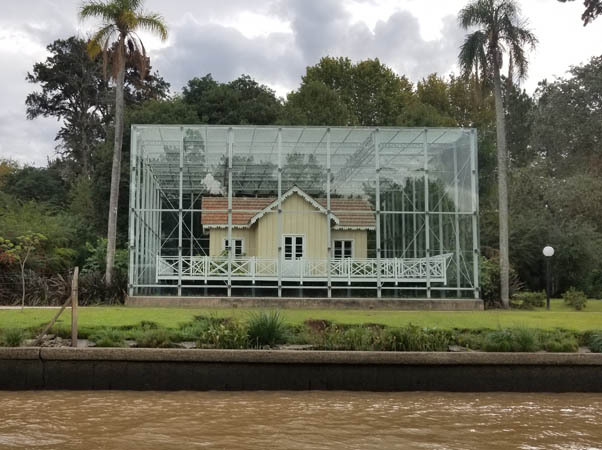 Talk about glass houses. Yes, all sides including the glass roof encased this small home. 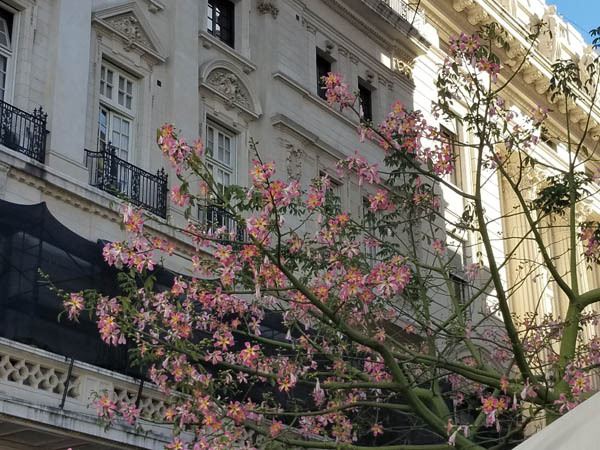 Argentina's web page includes April 10 through April17.